Edinburgh’s International Festival and Fringe are in full swing, stars and wannabes from all over the globe heading for the Capital hoping to find themselves centre stage. But, as far as Hibs fans are concerned, the biggest draw of the lot is Easter Road striker Jason Cummings. The 21-year-old has attracted more headlines than many of those treading the boards around the city can only dream about. Yes, a few of them may not have made the greatest of reading for the youngster but, as any celeb will tell you, that comes with the territory when you find yourself in the public eye. Cummings, though, is no shrinking violet, a kid who takes a carefree approach to life, accepting the knocks and simply getting on with enjoying himself, no more so than when he’s out there on the football pitch doing what he knows best – scoring goals. It’s those goals, 50 now and counting, which have ensured scouts the length and breadth of the country – and beyond if some reports are to be believed – have sought the best seats in the house to see him in action at first hand. 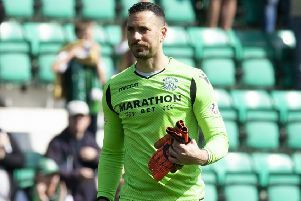 There’s been plenty of speculation for months now about his future with English League One outfit Peterborough the first to put serious temptation in Hibs’ way, a reputed offer in excess of £1 million and rising to £1.7m with “add ons” having been put on the table and just as quickly rejected. Hibs boss Neil Lennon spent much time over the summer persuading his star man to stay – including inviting Cummings to Paris where he was working with the BBC during the European Championships where the player rubbed shoulders with the likes of Alan Shearer and Rio Ferdinand – and is in no hurry to lose him, come what may. But, as he admitted, Lennon knows from personal experience that every player has his price and that he’s likely to find himself confronted by a double-edged sword, every goal Cummings, Hibs’ top scorer in each of the last two seasons, claims simply adding to the interest in acquiring his services elsewhere. Cummings himself insists he’s happy to stay put, determined to help restore Hibs to the Premiership in this their third season in the second tier of Scottish football, revealing he’d be lost away from his friends and family in Edinburgh without even the ability to boil an egg. A double against Falkirk to ensure Hibs got their latest bid for promotion off to a flying start can only add to Cummings’ reputation, the Easter Road outfit bouncing back from having their hopes of stepping up last season wrecked at this very venue to serve notice that they are ready to live up to the bookies’ rating of title favourites. Certainly, it wasn’t their most fluent of performance, Lennon conceding his side lacked a bit of composure at times on the ball but admitting it was “a fantastic win,” happy with the way his players managed the game after Cummings had given them the lead for the second time. It had taken Cummings only 88 seconds to get his own season up and running, the first to react after Falkirk goalkeeper Danny Rogers could only push James Keatings’ shot aside, that lead short-lived as Craig Sibbald hammered home a glorious drive from 25 yards. Cummings, however, as Lennon said, was a constant “threat, a thorn in the side,” for Peter Houston’s men and put Hibs ahead again just three minutes into the second half, holding off defender Luca Gasparotto to get on the end of Grant Holt’s ball over the top – a ploy which caused the Bairns problems all afternoon – to fire home what proved to the the matchwinner. Insisting there are “no limits” to what Cummings can achieve, the midfielder said: “Jason is on a four-year contract, he is happy here. He won us the game single-handed. I know we helped him, but he scored two goals and was the best player on the pitch. It’s brilliant to have someone like that in our team. You are guaranteed goals so I do not know what price you can put on that. But, as long as he is here scoring goals, I am sure he will be happy. Cummings was linked with a move over the summer, including to Turkey, as he prepared to enter the final season of his contract but McGinn insisted he wasn’t surprised his former Scotland Under-21 team-mate had stayed in Edinburgh. He said: “Not at all. Hibs are a big club that means so much to a lot of people. It’s a privilege to play in front of so many fans every week so I think Jason is in no rush to leave. “Other teams are going to be watching, that’s what happens if you are doing well so I hope other teams keep watching because that means Jason is doing well. “He is getting better all the time. We were lucky to have a really good manager last season and we have a really good manager and coaching staff this year. They are working on the players and we are getting better and better. As manager Lennon will, of course, have the last say regarding Cummings should that “ridiculous” offer ever be made but he stressed: “I know from my own experience that everyone has a price, but there are not many clubs who can meet our valuation of Jason.